To the rest of the world, it’s an abstract print of graphic wave patterns. To those in the know, it’s a personal message, spoken aloud and rendered as a work of art. 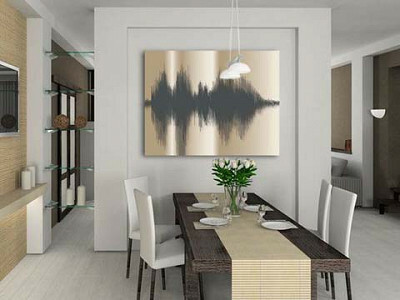 Brian Curfman, the founder of Voice Art Gallery, was inspired to create art from voice recordings after he made an e-card with an audio message for his wife and noticed how interesting the sound waves looked. Brian started making custom prints of sound recordings for his family and friends, and his wife encouraged him to grow the artistic pastime into a business so anyone could turn words into art. Voice Art Gallery makes it easy. First, you record a message using a tool on Voice Art Gallery’s website, or you can upload your own audio file. Up to four words is a typical message length, though you can opt to record more (the fewer words you record, the more detail you’ll see in the sound waves). Next, you choose a size, color scheme, and framing option, and then preview a design proof before finalizing the artwork. Voices are like fingerprints, so no two prints are alike. 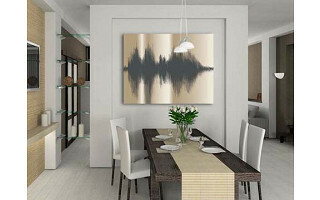 Displayed on a wall, the sound waves can be a visual reminder of a message from a loved one, an inspirational quote, and special occasions (baby’s first words, a proposal). There’s no text on the artwork, so the message stays as private as you want it to. Hi Fellow Grommeters! I am thrilled to have the opportunity to introduce you to the world’s most sentimental art and answer any questions you may have. Voice Art takes your personal message and transforms it into canvas artwork that is truly your own. Our team at Voice Art Gallery is passionate about customer service and providing the highest quality products so please let me know if there is any way I can assist you. I have a privacy-related question. When submitting a clip, can you or your employees actually listen to it? Or is it automatically processed into the soundwave image? @ Joanna - Thanks Joanna! To the rest of the world, it’s an abstract print of graphic wave patterns. To those in the know, it’s a personal message, spoken aloud and rendered as a work of art. 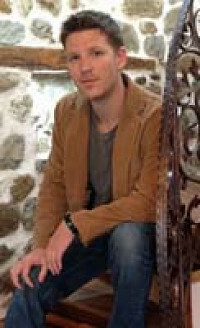 Brian Curfman, the founder of Voice Art Gallery, was inspired to create art from voice recordings after he made an e-card with an audio message for his wife and noticed how interesting the sound waves looked. Brian started making custom prints of sound recordings for his family and friends, and his wife encouraged him to grow the artistic pastime into a business so anyone could turn words into art. Voice Art Gallery makes it easy. First, you record a message using a tool on Voice Art Gallery’s website, or you can upload your own audio file. Up to four words is a typical message length, though you can opt to record more (the fewer words you record, the more detail you’ll see in the sound waves). Next, you choose a size, color scheme, and framing option, and then preview a design proof before finalizing the artwork.